I got a call from Guy McCaskie this afternoon, Saturday 20 Oct. He was at Fig Lagoon near Seeley and he had just found an immature Red-necked Grebe. The only other record for this species in Imperial County was a bird found near the Colorado River by Henry Detwiler so this is the first time it has ever been recorded here in the Imperial Valley! It was in the middle of Fig Lagoon and I was able to get a few blurry documentation pictures by placing a digital camera on my spotting scope (digiscoping). The first image is an extreme crop from the second image. 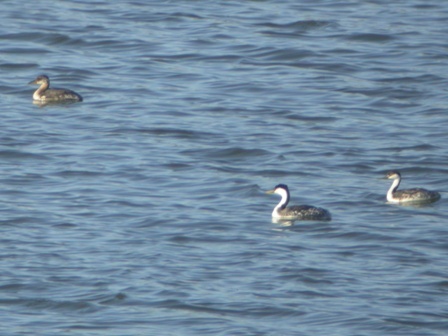 The second image shows a pair of Western Grebes with it for size comparison. 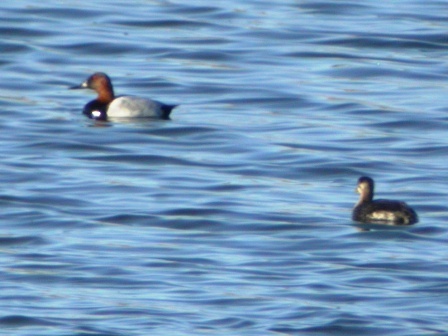 The third image shows it with a Canvasback for size comparison. There are seven species of grebe that occur in North America. Western, Clark’s, Eared, Horned, Pied-billed, Red-necked and Least. Five of them, Western, Clark’s, Eared, Pied-billed and Red-necked are on Fig Lagoon right now! 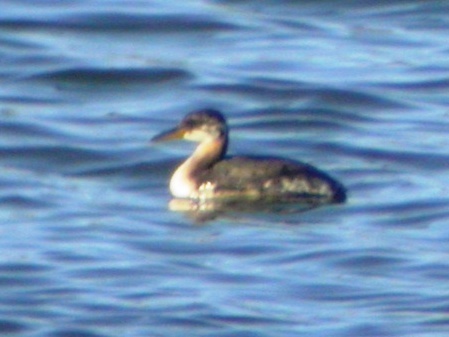 Horned Grebe is found in Imperial County only occasionaly. There is only one record of Least Grebe here in Imperial County and only two records for the entire state of California so now all seven species have been seen right here in our own backyard!! The Google Map below is interactive. Click inside it to move around or click on the link below it to open it in Googl Maps where you can see the legend. See ya at the sea……………….